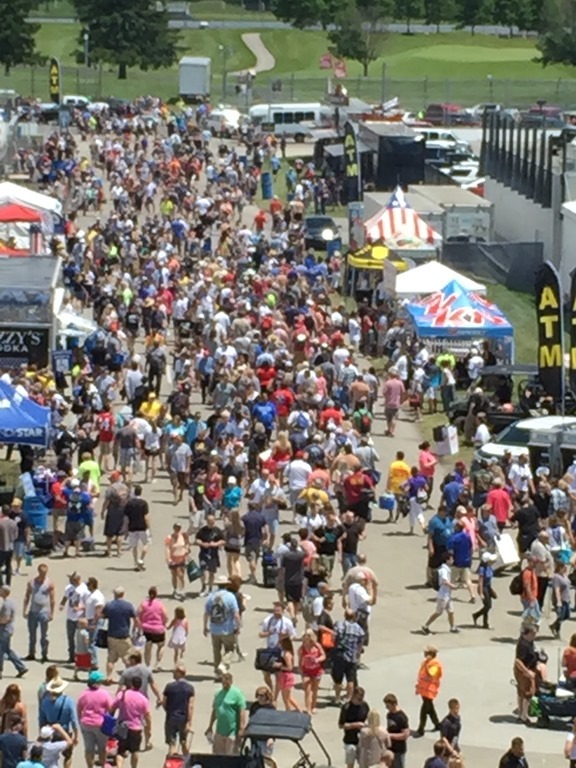 « Welcome To Carb Day At IMS! 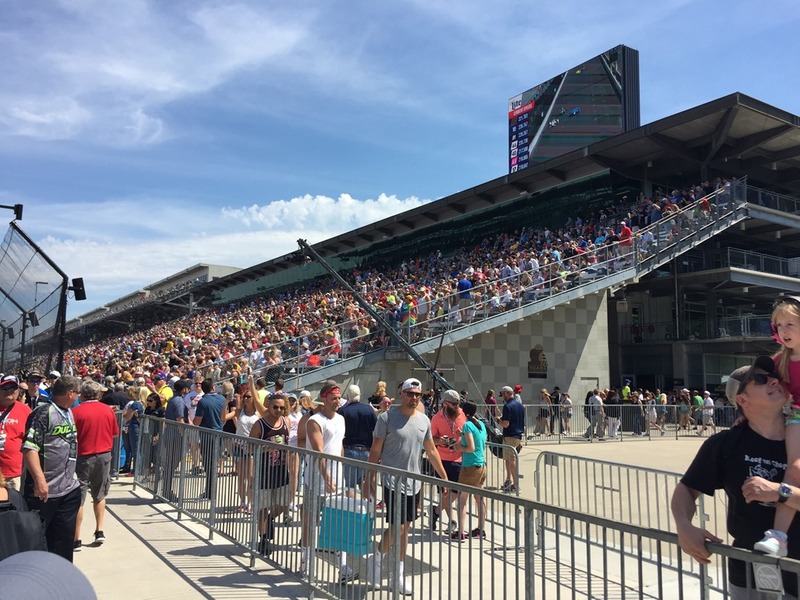 The Verizon IndyCar Series had their final practice this morning and ten the Indy Lights Freedom 100 took place. As I type, the Tag Heuer Pit Stop Competition is taking place. I was out in the crowd for the practice and the race, but I took to the confines of the IMS Media Center for the Pit Stop Competition. The crowd here is huge. 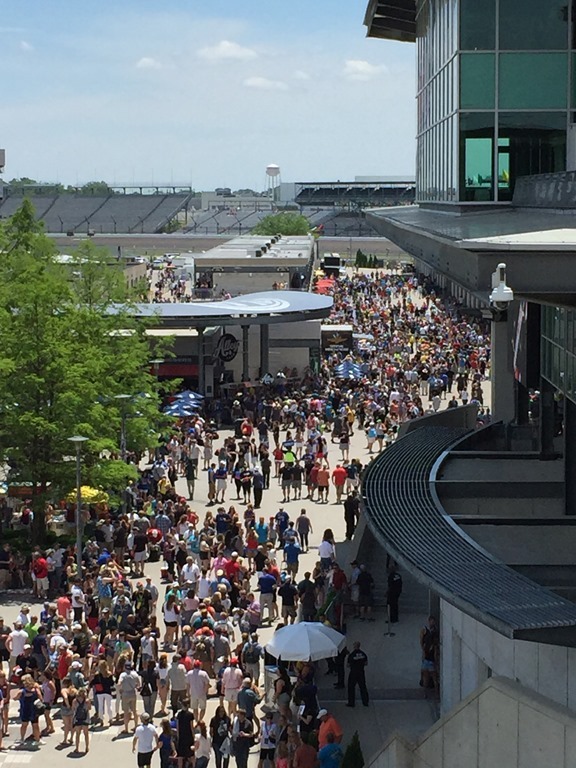 To me, it seems like the biggest crowd I’ve seen for Carb Day – and it’s still early. The crowds in the stands to watch a one-hour practice beginning at 11:00 on a Friday morning were impressive. The practice session was interesting, but I’m not it told us much. Helio Castroneves paced the field with a top lap of 227.377 mph. After Helio’s Chevy, the next seven cars were all Hondas. Cars in positions two through seven were driven by Takuma Sato, Tony Kanaan, Scott Dixon, Fernando Alonso, Graham Rahal and Alexander Rossi. Penske teammates Josef Newgarden and Juan Montoya were eighth and ninth quickest respectively in their Chevys, while Ryan Hunter-Reay rounded out the Top-Ten in a Honda. For those keeping count, that’s only three Chevys in the Top-Ten. There is another statistic that is interesting t follow and ever-growing – the number of Honda engine failures for the month. That number grew in practice when the engine of James Hinchcliffe gave out with about fifteen minutes to go. It’s certainly better to have happened this morning than on Sunday, but it did nothing to assuage the fears of those with Honda powerplants in their cars. 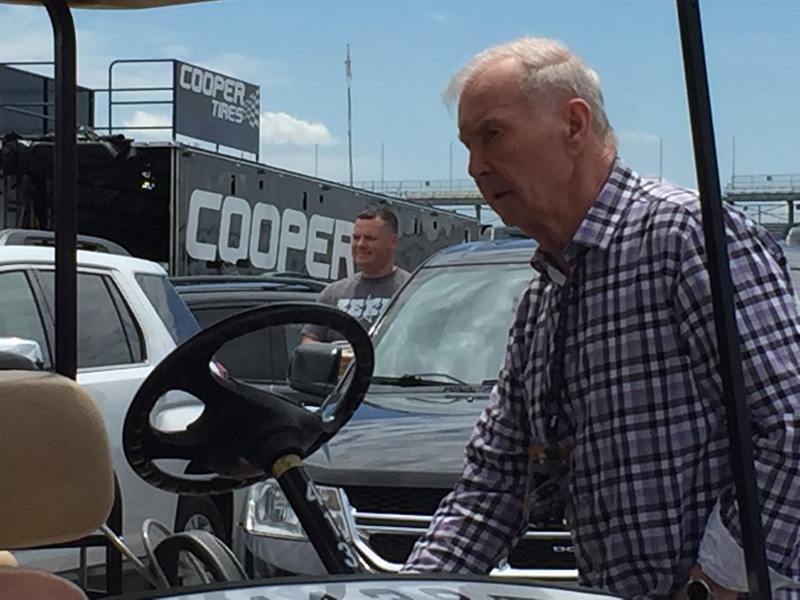 We had lunch at the Honda Hospitality tent and I happened to look over to see Parnelli Jones climbing onto his golf cart just on the other side of the barricade. He is one of the living legends of this sport and I couldn’t reach for my phone fast enough to snag a picture. It isn’t a great picture, but I had to act fast. He drove away quickly – still showing the speed he showed in Silent Sam – fifty years ago this month. The Pit Stop Competition is now over, won by Will Power. With that, track activity is done for the day. That means the mayhem and debauchery that is Carb Day begins. I’m not sure when the Steve Miller band starts, but it will bring even more craziness. These pictures were taken this morning from the terrace of the Media Center. It is worse now. Thirty-five years ago or so, this would have been right up my alley. Today, not so much. I will also admit that I have been spooked by the weather forecast for tonight, and we will forego the Burger Bash for the first time in years. Instead, I’m going to meet up with my brother and his crew and go karting at Sarah Fisher’s Speedway Indoor Karting and then eat at the adjoining 1911 Grille. We ate their last weekend ad it was very good. We’ll save Dawson’s for tomorrow night. That’s going to do it for us today, now that track activity is over. But we’ll be back here in the morning. We’ll have breakfast at Charlie Brown’s and then get here in time to see the roadsters run at 9:00. Then we’ll make the annual trip to the museum (my fourth trip this month). At some point, I’ll take some time Saturday afternoon to take in the silent track and reminisce about the races I have personally seen here, along with some of the more memorable moments that have taken place here over the past 106 years. I look at the straightaway and think about Parnelli Jones and Jim Hurtubise swapping the lead, or that horrible moment when Dave MacDonald and Eddie Sachs were fatally injured. I think about Ray Harroun driving the Marmon Wasp to victory over an entire track of bricks, wondering if he had any idea what he was laying the groundwork for. These are some of the thoughts that run through my head time I’m in this facility. I don’t think I’m the only one who can say that, either. So check back tomorrow. Also follow our weekend on Twitter. You can follow me at @Oilpressureblog and Susan at @MrsOilpressure for photos and comments. 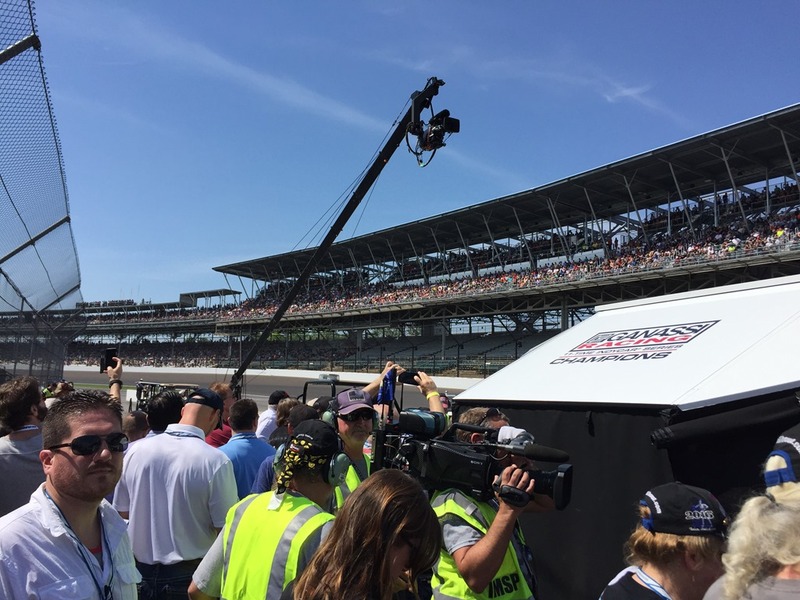 This entry was posted on May 26, 2017 at 3:08 pm and is filed under Indianapolis 500. You can follow any responses to this entry through the RSS 2.0 feed. You can leave a response, or trackback from your own site. Among the many, memories I have from my 39 or 40 years of being at the track in May, at the top is the quiet at the track the evening before the race and the couple of hours before the cannon sounds to signal that the gates are open. Many of those years I didn’t get away from the track until nearly dusk on race day and it was almost eerie to see all of the evidence of the people who had been there that day, but also to experience the deep silence once again. Aaron Telitz of Birchwood, Wisconsin is a rising IndyCar star. You can take that to the bank. Today in the “100” he pulled off a Sam Hornish Jr. style pass to finish second at the bricks.